While the Closed Beta is understandably on every Annoholic’s mind right now, we are already setting our eyes on the future to ensure that some of you can enjoy the full game in style come April 16th. To this end, we have joined up with our friends and fellow sailship-enthusiasts at CORSAIR, who are providing some of their great gaming peripherals as prizes. Introducing- the Anno 1800 Closed Beta Screenshot Contest! To participate in the contest, all you have to do is play the game all the way up to tier 3 (the Artisans), cross the ocean and share your most beautiful New World screenshot with us. 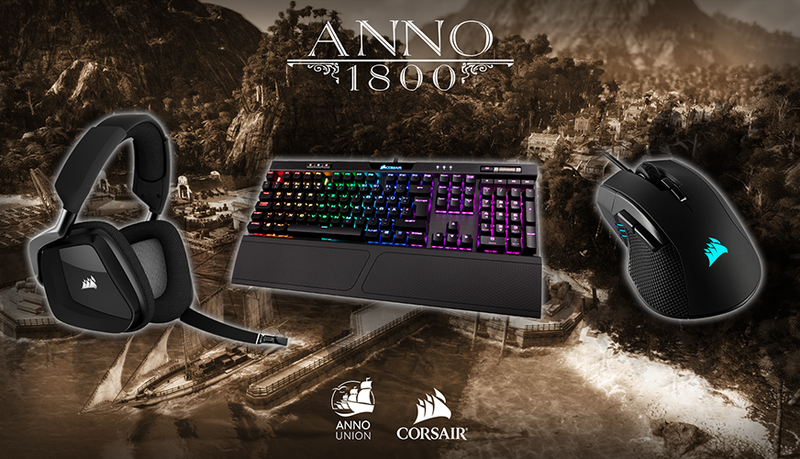 Moreover, if you did not get the chance to get an Anno 1800 Closed Beta code yet, CORSAIR got you covered. Get all the details on the contest and code giveaway here! The screenshot challenge starts today and ends February 5th at 23:59 CET. To give our team some time to browse through your scenic New World shots, we will announce the winners on Friday, February 8th. 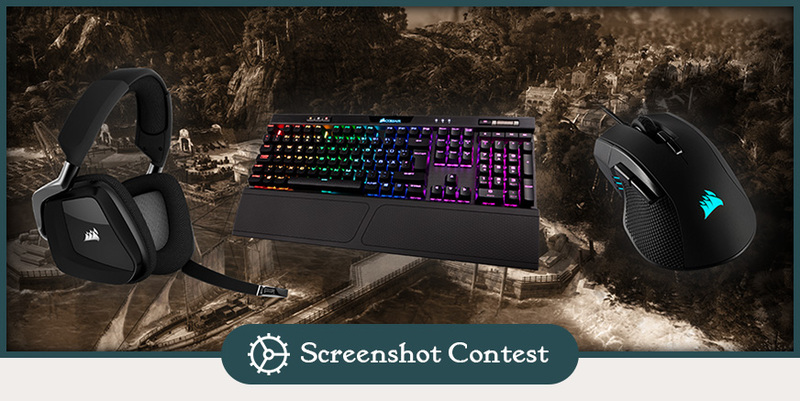 Thanks again to our friends at CORSAIR for sponsoring this contest. Enjoy the Closed Beta, give us feedback aplenty and good luck for all participating photographers! Can anyone tell me where exactly I should share my screenshots? On the Forum? Other social media? Hey Blue Byte team. The closed beta is great as far as I could play, but I have the same problem that I had in the alpha test. No “Anno7” or similar folder appear on my documents, neither starting the game as administrator, so the games that I play are not saved after I go out of the game. You can create a new account in your Windows without special characters. I hope that in April there will be no problem when other languages ​​are introduced. How to share screenshots? Personally I prefer some keys for full game, not the hardware you’ll never send to my country anyway. The allowed parts of the overhauled game felt great. The art design looks cool but more importantly feels authentic. As a strategy/city-management game, it has a lot of depth. The UI and UX designs howerver, needs rework on few areas and I’m going to focus my writing on this topic. The good part is most information can be visually seen on screen without clicking. E.G. Crowded roads, Fire, Trade routes, Resources. This is really great not just aesthetically but reducing the unnecessary clicks. Using only sliders to adjust the number of goods or etc. is taking too much control over the player. Strategy players often want to optimize their game within their own respectable experience. Even the most casual player would like to adjust a desirable number from time to time but he/she can not. Even though there are lots of spaces left on the UI this big interface is only there to cover up the beautiful screen and that brings me to my next topic the big interface. It’s understandable to choose a certain style of UI design. Anno 1800 has chosen a big interface design where even sometimes covers up the full screen. E.G. Events, diplomacy, etc. Games like Frostpunk has this same approach but the usage of this in here isn’t innovative enoıugh. For events, it’s good for the player to get away from the strategy aspect mind and completely refocus on the new world events but at the same time, the game continues behind. It’s bad because of a fire, battle or something similar could happen and the player forced to rush decision and continue the strategy mind. That’s why these mini-breaks don’t exactly work as it should be. The game needs to be paused. On the play screen, the amount of information is sufficient but this big interface gets in the way especially when changing the island because every time it gets reset! I had to click multiple times on the same things to close but they reopen every time I switch island or load a save. And that’s the next thing I want to write about. The unresponsive UI. This UI approach is slow and it really slows down the game too much. Things like trading goods with port and ship, accepting quests, ship right-clicking and quick-build interface via right-click has to get fixed. They need to be responsive and fast; the player has to go around with multiple islands and the game is real time. The interface shouldn’t increase the challenge. The game needs an “annual” book. Let us compare our statics -say- 20 minutes ago. How much income I’ve made with trading? How much expenditure I’m spending to sustain artisan income? Deeper statics has been present in the game. Options-Controls menu clumped up too much. It’s a player nightmare to go through that controls window. It has to be grouped up. Tooltip information is needed for the graphics in order to do what’s doing what and how much they are affecting the system. I think If we get to name some areas/neighborhoods within the island it would be great. Let’s say I have this good neighborhood in the middle of my city and It would be cool If I could name that place or a port area. Even naming a big park area or a boulevard! Also, since we get to discover a new world. It would feel right to name places there too for being the first to discover. Maybe even naming a mountain or river would feel great for the player. Thank you really looking forward to the game to release. I hope you improve the UI controls because this game has great potential to be a classic. I really mean it. anyone still got a spare invitation? i would love to play the game!! Very excited about this but seem to not be able to get any code..
1) You can follow Anno on Twitter. Which is what I personally did. 2) Watch the Anno 1800 Closed Beta trailer. And you should be all set man. Let me know how it went for you. cool, could use a headset :D.
Good luck to all those who where selected for the beta! And may the best Annonians win! I unfortunately did not get a code, but that’s alright. I still look forwards to the game on release on April 16! Although I am excited to play the game. I absolutely love how it is slowly coming together! I’m already well geared up with CORSAIR products. And very well prepared for the game. So I will respectfully drop out of the competition. CORSAIR has some great stuff, and are one of my favorite peripherals creators. Though I am glad to see that ANNO and CORSAIR are great friends, and allies. It is great to see the 2 come together. I sense many great things to come from this! Oh yes! I also have a very good question for the “marketing man” Marcel. I been curious to know if there is any chance of ANNO 1800 merchandise making it’s way to Canada and the USA. Such as all the pins, shirts, and items for example. I know that some stores like GameStop and EB Games sell merchandise from big game titles. But I never seen any ANNO merchandise. And I been dieing to get my hands on the pins all of them, and shirts. I have a hat that I like to put all the ANNO pins on, and I definitely want the shirts too! I love the Anno Union, the ANNO game series, and I am happy to be a proud member of it! Anno has been a part of my life since my early childhood, and I grew up with the entire series. I been playing the series since it started 20 years ago. And I would love to get my hands on the pins, and shirts. It’s a great treasure, and memory to have after all these years. I even called EB Games today and asked them if they expect any shipments of ANNO 1800 merchandise. But they couldn’t give me any answers yet. So I think this is a very good question to ask Marcel about. To see if there is any chance of this happening. It would for sure sell. There are a lot of ANNO players in Canada that would love to get their hands on the stuff. As well as in the USA. I myself am from Canada. I would love to see ANNO merchandise in stores here. I would definitely go for it. I hope Marcel can give us a definite answer on this, or even consider this. I hope to get an answer soon if possible! Look forwards to the game in April 2019!